Cousins malayalam movie directed by Vyshak featuring Kunchako Boban and Indrajith in lead is made with a mamooth budget of Rs 10 Crores. Scripted by Sethu, the movie revolves around four Cousins and their journey. Suraj Venjarammoodu, Joju George, Vedhika and Nisha Agarwal, Nemumudi Venu, Kalabhavan Shajon and Pradeep Ratwat will also be seen in prominent roles. The movie is currently undergoing shoot at Bangalore Palace and have Bangalore, Pollachi, Kodaikanal, Athirapally and Ernakulam as locations. Multi –starrer projects are not new in malayalam film industry. After having a detailed study on the making of other south Indian movies and the choice of the audience, Vyshak is all set to surprise the moviegoers with his next venture. After creating his own space in the industry, Vyshak is giving final touch to his upcoming movie. Titled 'Cousins', the movie made with a mammoth budget of Rs 10 Crores will be packed with humour, dance, songs and fight sequences which could keep the viewers intact. Being a wise filmmaker who is clearly aware about the pulse of the moviegoers had roped prominent actors to play the lead and other prominent roles. Kunchako Boban, Indrajith, Vedhika and Nisha Agarwal would play the lead roles while the cast is being supported by Suraj Venjarammoodu, Joju George, Vedhika and Nisha Aggarwal, Nemumudi Venu, Kalabhavan Shajon and Pradeep Ratwat. Scripted by Sethu, the movie revolves around four Cousins and their journey. As the cousins take a trip, they face a serious crisis during their travel. The movie is a thriller peppered with humour. As the movie is being set along the Kerala-Bangalore border, Nisha Aggarwal was been choosen to play a prominent role rather than a malayali beauty. Nisha Aggarwal, the sister of Kajal Aggarwal's sister who made her debut in Malayalam through Johny Antony's Bhaiya Bhaiya opposite Kunchacko Boban is excited to work again with a well established team of talented people. As the story was very new and the role was different from her previous ventures, Nisha readily agreed to work for the movie. The movie is currently undergoing shoot in a single schedule at Bangalore Palace and have Bangalore, Pollachi, Kodaikanal, Athirapally and Ernakulam as locations. Director Vyshak who had given mass entertainers like Pokkiri Raja, Seniors and Mallu Singh is yet again gearing up to give an out and out entertainer with an element of suspense. The movie which is currently progressing in Bangalore had recently made news for its grand song sequence which is made with a budget of Rs 80 lakhs. About 600 dance artists and 50 horses participated in the song sequence which was purely filmed at Mysore palace. A grand set, special outfits designed for the actors, dance artists and horses for the song sequence would be a visual delight. Penned by Rafiq Ahmed and composed by M Jayachandran, this fast number is sung by Shreya Ghoshal. 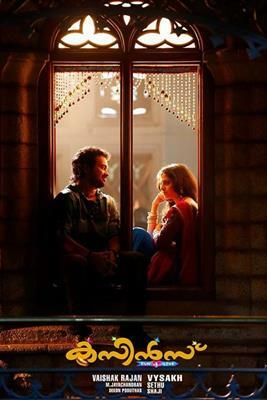 It has also been recorded as the most expensive song sequence ever shot in malayalam. The camera is being helmed by Pradeep Illampilly. Joseph Nellickal has done a great job working as the art director. The movie is produced by Vaishakh Rajan under the banner Vaishaka Cinema. After the post production works, 'Cousins' would reach theatres as a December release.